Within first three minutes into the movie, Russell Crowe, starts speaking in verse. I knew, immediately, that its music would be good. But I did not expect the whole movie to be in the same unusual format. This 2012 film - adapted from the 1985 musical of the same name - is based on the literary-masterpiece and hit-novel of Victor Hugo, first published almost a century earlier, in 1862. With the movie tag-line proclaiming ‘The Musical Phenomenon’ on all posters, I obviously expected music. But, I did not expect music all through the movie. I did not expect that there would be no normal dialogue. So, watching Hugh Jackman , Anne Hathaway, Amanda Seyfried, and all other actors sing-song their way, through a dark and grim movie, could seem unnerving and irritating to some. But being a lover of musicals, and having seen an earlier version of Les Miserables – which, by the way, Hollywood has remade at least 4 times - I found this version of Les Miserables powerfully touching. You might like to know that the movie should be correctly pronounced in french as, Lay----me-zah-ra'a-bl. Which means 'The Miserable Ones'. 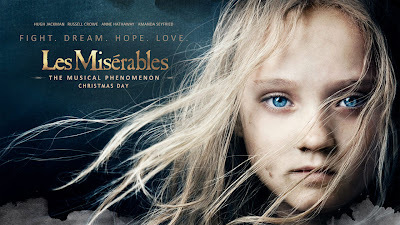 Jean Valjean, the protagonist (Hugh Jackman), is the first miserable one. He is just released from prison in 1815, in post-revolution France, when France is experiencing several after-shocks of revolutionary activities. After his release, this man, our prisoner 24601, stays a night at a Bishop’s house, but is tempted to steal again. The Bishop’s pardon, however, makes him a new man (Some may have read a famous short-story called ‘Bishop’s Candlesticks’ based on this portion of Hugo's novel). Anyway, he becomes a rich gentleman soon. Our prisoner. Not the Bishop. But since Jean Valjean has broken parole, he is being chased by a determined Inspector Javert (Russell Crowe), who vows to bring the ex-convict to justice. Meanwhile, in one of Jean Valjean’s factories works a young lady called Fantine (Anne Hathaway). Her jealous self-righteous colleagues drive their immediate boss, to sack her. Her crime? She's an unwed mother. Left by her lover. We learn that Fantine's child's name is Cosette (Amanda Seyfried). And it is for Cosette's upkeep that she needs money. She regularly pays an Inn Keeper and his wife - rascals cheating everyone - who demand more and more money from Fantine, to take care of her daughter. With no job, Fantine ends up selling her hair, her teeth and even herself, at a dark, dirty den of prostitutes. Now, the rest of the story is all about how Jean Valjean, our prisoner 24601, promises to a dying Fantine that he will take care of her daughter Cosette. And how he goes to Paris, how he and Cosette get caught up in the June Rebellion, how they try to escape the persistent grip of Inspector Javert, how Cosette grows up into a beautiful lady, how she falls in love with a revolutionary activist Marius, and how - in the background of France’s post-revolutionary times - several aspects of human judgments of the main characters are put to severe tests. Duty. Justice. Forgiveness. Love. Hope. Strength. They are all dealt with in a thought-provoking manner. I think the movie does justice to the book. My favourite songs are two. First, ‘I dreamed a dream’ by Fantine (which Anne Hathaway sang herself, in the movie), but which we all know as being made popular by Susan Boyle - when she performed it (from the stage musical, Les Miserables) in Britain’s Got Talent. I still feel Susan Boyle’s stage rendition was a lot better than Anne Hathaway's movie rendition. Second one, Red And Black , a song in ABC Café, where students, led by leader Enjolras, meet to discuss their revolutionary plans. It has that powerful revolutionary beat to it. A very appropriate chant-song showing us the mood of those times. People in poverty and misery yearning for the overthrowing of the government. Technically, the movie should be rated brilliant. At the start of the movie, when the camera pans from the front of a huge early 19th century ship up to the masthead and zips down through the ropes to zoom-in onto prisoners pulling the ropes, made me wonder how much they have been spent for a shot that is barely a few-seconds long. The dark and dirty, muddy and murky, alleys of decadent brothels, and the wide and long, bright and busy street scenes of Paris of early 1800s show us that the preparation of sets as well as the work of camera is excellent. I only wished there were some dialogues. But from the way the Arabic audience was sitting with rapt attention, reading the sub-titles, and following this musical story, I know it will appeal to audience with taste. From the way it deals with a range of moral issues, from Duty to Love, from Patriotism to Tyranny, I can say it is a masterpiece. Yes. You can judge a book, by its movie. Beautifully penned Joel and punctuated familiar references points. Thank you for unraveling it and now I would be less miserables buying a ticket to watch it.